Professionally filmed video footage of METALLICA performing the song "Sad But True" on September 26 in San Francisco, California can be seen below. The band played at Civic Center Plaza as part of the ninth annual Dreamfest fundraising event for UCSF Benioff Children's Hospital. 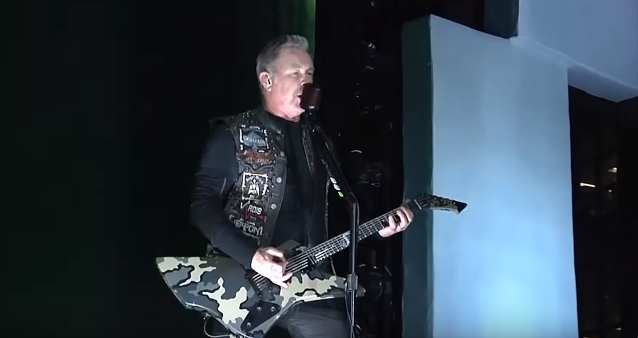 According to SF Gate, METALLICA's performance angered some of the neighbors because of the noise, which traveled a considerable distance across the city. People reported hearing the concert from as far away as Dogpatch, Cole Valley and the Mission. The performace was part of Salesforce's annual Dreamforce conference and the goal was to raise millions for UCSF Benioff Children's Hospitals, the hospital that bears Salesforce CEO Marc Benioff's name. "Not a dream for me," wrote one local resident on Twitter. "Wrong to make an entire city a private venue. Anyone who thinks it's great is probably going home at the end of the week." "Most people outgrow making the neighbors listen to your favorite band sometime in college," tweeted another neighbor. "Clearly Salesforce thinks it's a good look in middle-age." The evening began with a reception in which Dr. Michael Anderson, president of UCSF Benioff Children's Hospitals, presented Myla Cunanan, a 14-year-old cancer survivor, with the UCSF General Colin Powell Medal of Courage Award. The $1,000-per-ticket event also included appearances by Janet Jackson, plus MC Hammer and DJ Rob Garza in an after-party from 9:30 p.m. to midnight in City Hall. In total, the annual concert has raised $60 million for UCSF Benioff Children's Hospitals. Dreamforce is described as "four days of innovation, inspiration and learning, equality, giving back and fun for the Salesforce community."